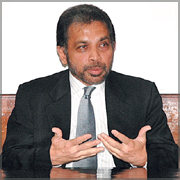 COLOMBO: Secretary General of the Government Peace Secretariat Dr. Palitha Kohona said that the LTTE's overt rejection of peace monitors from EU countries was a mere eyewash in order to keep away from participating in the Oslo talks. In an interview with The Hindu the SCOOP Chief noted that although recruits are from Scandinavian countries they function under Norwegian authority. "It is simply like the UNICEF.The US has banned the LTTE. Does it mean that the Head of UNICEF in Sri Lanka who is an American, is unacceptable to the LTTE. We feel that this was an excuse for not participating." He also said the LTTE should also realise that violence is not the way to achieve their political goals. The world has changed since the 1950s and 1960s. It no longer tolerates terrorism as an acceptable means of achieving political objectives. On the LTTE's denial of violent acts attributed to it while insisting the State was behind them Kohona declared that the claim was hollow since all such acts fitted into a pattern in the past. "The LTTE is clearly behind all of them. You also have to remember that they denied killing Rajiv Gandhi. Despite their denial, those responsible including those who conspired have been sentenced by an Indian court at the highest level". Asked about a possible starting point for negotiations Dr. Kohona said the starting point should ideally be the substantive issues. Similarly, human rights, humanitarian and development issues could also be the beginning." He said the government was willing to continue talking, whether it is on substantive issues or on peripheral issues". He said he hoped India would play a constructive role in the resolution of the conflict. It could be the role of a close neighbour, it could be the role of a friend who has been around for 2000-odd years. Questioned on the President's election manifesto where it was, mentioned about inclusive talks and a direct meeting with the LTTE. Kohona said it was his view that any solution worked out without the LTTE is not going to be practical at the end of the day and it was the wish of the Government to encourage them to comeback to the talks. "This country does not need any more violence. It needs the two parties to sit down and workout a solution that is just and equitable". Asked about retaliatory attacks on the LTTE 's Iranmadu Airstrip Dr. Kohona said that the Government is obliged to comply with certain international standards and rules and regulations. These do not permit the existence of illegal airstrips. It is in compliance with those international standards and rules that the Government was compelled to take out this airstrip. He said the Government has taken a number of steps to ensure that any refugee flow does not head in the direction of India, but is contained in Sri Lanka. He said the LTTE would like to create a flow of refugees to India because it is politically advantageous to it.